One original idea, even when applied only at the level of a singular element of design, can make an interior unique and unforgettable. 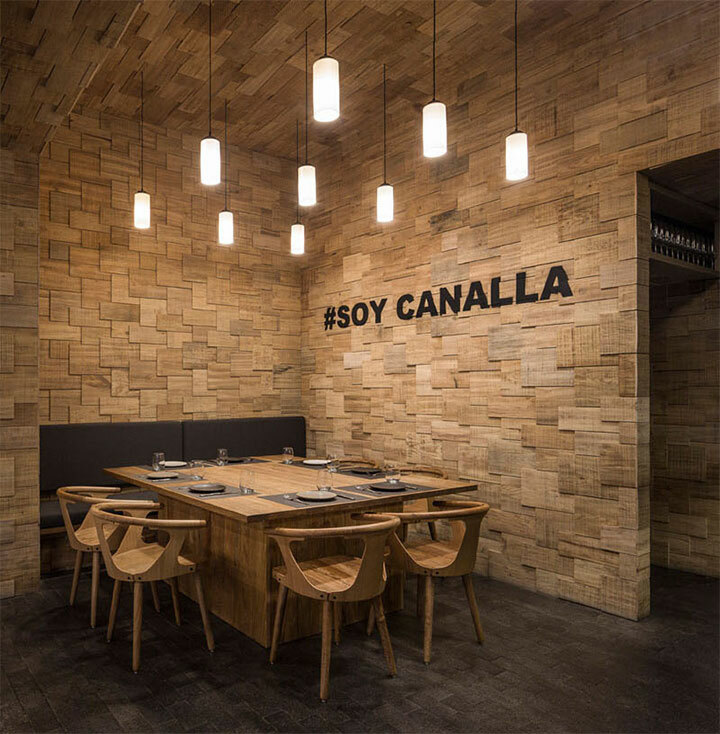 Barcelona-based Francesc Rifé Studio came up with such a winning idea when designing the Canalla Bistro restaurant in Mexico City. 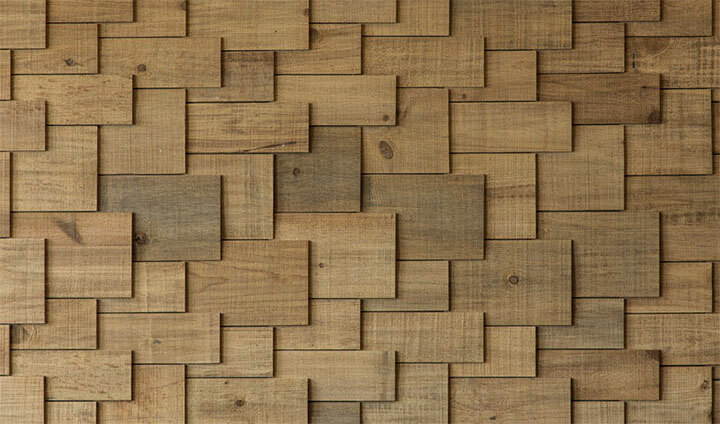 Wood shingles coming from orange crates were used to cover the walls and ceiling of the restaurant, giving its interior the right to be called unique. 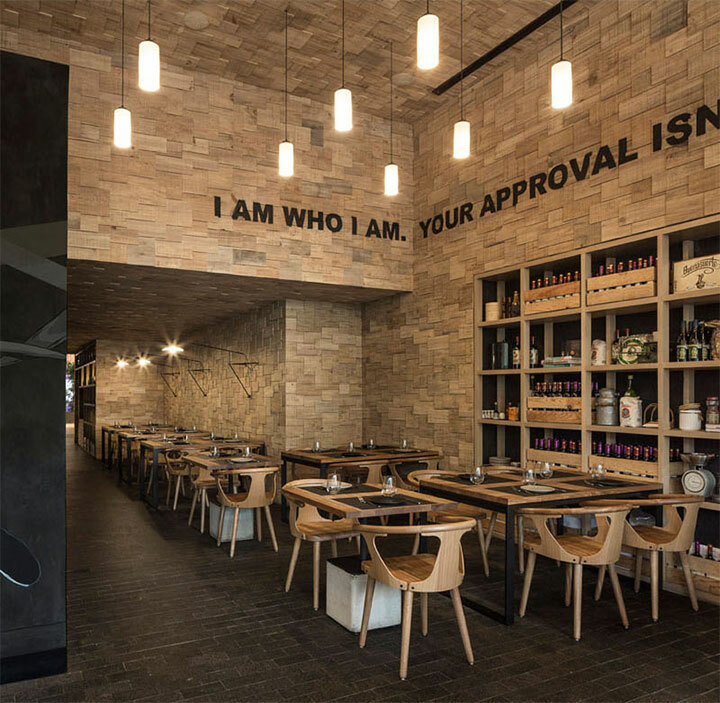 While such an idea can easily overwhelm a space if not done right, the consistency of this look throughout the restaurant and the perfect implementation of the idea achieved just the opposite. The interior looks fresh and, most importantly, warm and inviting. 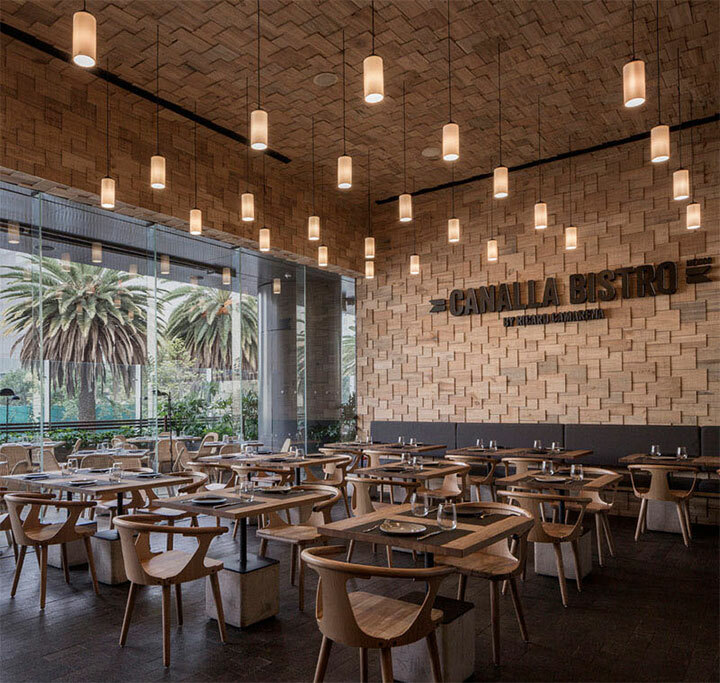 Partially covering one another, the wood shingles give the walls and ceiling not only texture, but a 3-D look that brings the whole interior to life. Echoing the shade of the modern wood chairs and table tops, the shingles look like a natural extension of the other elements of design. 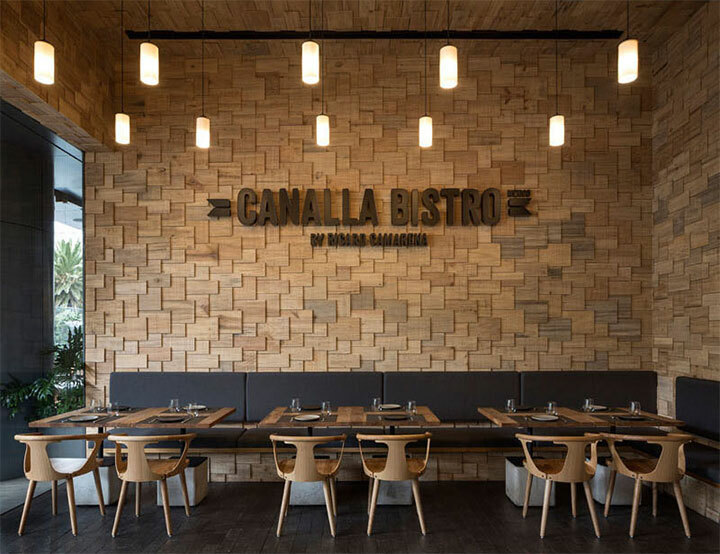 The furniture is simple, balancing out the intricate construction of the walls, while the minimalist light fixtures alternate from modern geometric to industrial. In keeping with the idea of simple materials, the floors were covered with tiles made of natural stone, that evoke the look of a cobblestone street. 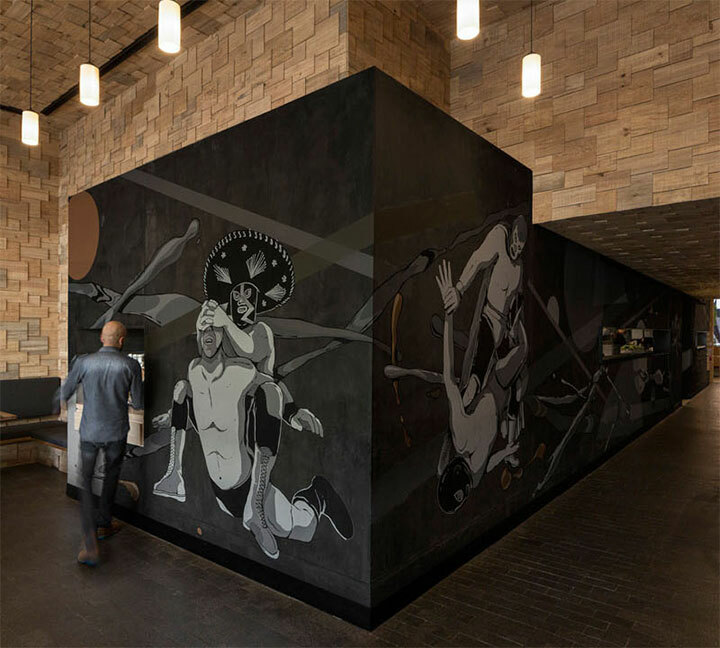 Aside from a graffiti mural in muted hues created by street artist Seher One and depicting Mexican wrestling scenes all over the external wall of the kitchen, the only other element of wall decor is a series of large inscriptions in a dark shade. They break the uniformity of the walls and give the space a personal touch.